It is Friday and el inglés, aka my hubby, is working from home, outside the weather is not very pleasant, so we fancied something yummy to cheered us up and I remember this dish “Bistec Ranchero” that would always put a smile on my dad’s face, it was his favourite breakfast ever, although we are having this as our lunch! So this is the way we cook “bistec ranchero” in my family, it is an easy and quick recipe. To make it, I bought stir fry meat in my local butcher or you can buy a steak and cut it in very thin slices, then fry it and add the veggies and listo! All you have to do is fried some beans and eggs. Chop all the vegetables and have them ready. Heat a frying pan then add the oil. Once the oil is hot, add the meat, fry for 5 min, mixing continuously and add all the veggies. Add salt and ground black pepper. While the bistec is frying, cook the beans and fry the eggs. 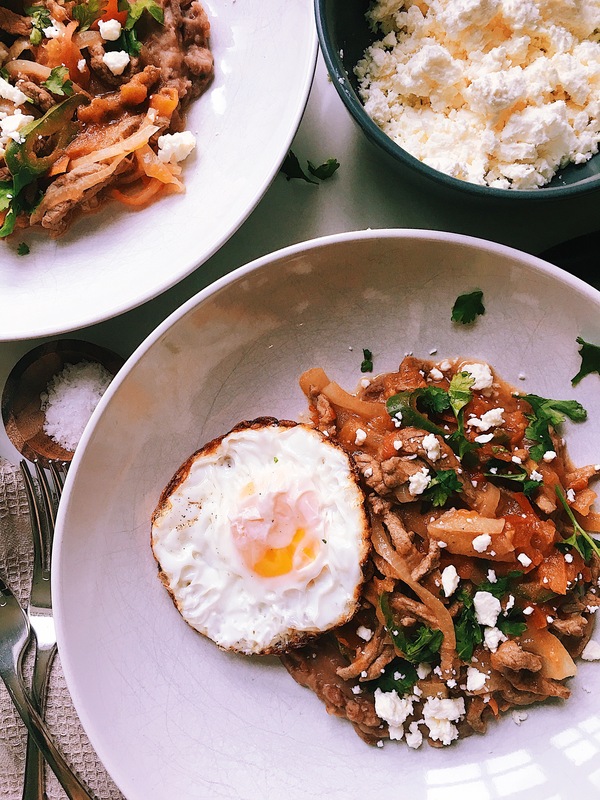 To serve, spread some refried beans onto a plate then put some bistec ranchero and the egg. Scatter some feta cheese and fresh coriander.